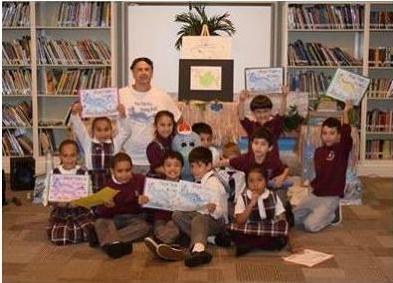 Preparing students at Connetquot Elementary for the Parents as Reading Partners program that began Jan. 27, author and educator Joe Shandrowski and his magical blue sea monster Huga Tuga brought the “Huga Tuga Live! A Pep Rally for Reading” interactive theater performance to the school on Jan. 17. The focus of the PTA-sponsored event was on the importance of reading, using a colorful light show, cartoon illustrating and bubble magic as tools to inspire students to become confident readers and writers. The connection to imagination was also emphasized with Shandrowski’s “Treasure Chest of Imagination,” as the young readers in attendance learned about the process that takes place when a book comes to life. “The Huga Tuga performing arts event was integrated with a unique literacy experience that entertained as well as educated our appreciative Connetquot audience,” said Principal Deborah Smith. Recently we had a Reading Pep Rally with Huga Tuga Reading Rock Live. During this show, author and illustrator, Joe Shandrowski shared an underwater adventure with us. He showed the children how reading can fuel your imagination when it comes to writing and illustrating. Along the journey, the children learned valuable lessons about life, family and friendship. Springdale School - Read Across America Kick Off! Joe Shandowski and Huga Tuga visited k-3 for a pep rally for Huga Tuga’s Reading Rocks Live! Reading event on Wednesday. Kids loved it and cheered loudly "reading rocks!" The Boyd children had a very informative assembly from author Joe Shandrowski. He showed the children how to write a book and to use one’s imagination. The children were actively engaged when Joe gave his explanation of how Huga Tuga, his main character came to be. The children heard some parts of his stories and even got a sneak peak of his new book’s cover. The students have a chance to order a signed copy of his book(s). Thanks PTA, for bringing us an author on National Reading Day! Use your imagination and interest in reading to remember “Reading Rocks”! Oak Tree School – READING ROCKS! January 24 the PTA sponsored the Huga Tuga – Reading Rocks assembly which demonstrated how enjoyable reading can be for everyone. Inspiring Imaginations: Today we went to an assembly about Huga Tuga. The illustrator taught us how to use our imaginations. Imagine you could create your own book character, what would it be called? What would it look like? Try to use a lot of descriptive words to help us picture your character. On Monday, March 31st Brunswick Acres welcomed author and illustrator Joe Shandrowski. Joe drove all the way from Conneticut on a rainy Monday morning to tell us all that "READING ROCKS!" and to teach us that using our imaginations and reading A LOT is the key to becoming good writers. We sang, we danced, and we totally rocked the gym with Joe and his magical blue sea monster, Huga Tuga Alabuga Beluga. Hope Highland School - Huga Tuga Says Reading Rocks! We started (our assembly schedule) with a Huga Tuga show on April 10th. This show was designed to motivate, captivate and engage our children into the world of books. From the feed-back I received, it did just that!!! Author and illustrator Joe Shandrowski visits Harley Avenue Primary School. Elwood students get in the reading spirit this month with a book pep rally. During an event at Harley Avenue Primary School, author and illustrator Joe Shandrowski spoke with students about using their imagination while reading. He then shared one of his books, “Huga Tuga and the Seashell Mystery” with students. During the story, the children followed the tale of friendly sea monster Huga Tuga who guides his friend Sarah on a journey into the sea to find out where seashells come from. The author encouraged the students to act out the scenes and imagine the characters' world using their imagination. In March, Parents as Reading Partners (PARP) organized an visit by Joe Shandrowski, author of a series of successful children's books. Joe came to Cottle and read from his book Huga Tuga, star of the Wonder Series – which takes students on adventures using their own imaginations. Since the release of the first book, Joe has used Huga Tuga to create a complete program he performs called "Reading Rocks Live! A Pep Rally For Reading." The performance was an interactive theater experience that included a spectacular light show, cartoon illustrating, bubble magic and the "Treasure Chest Of Imagination." During the performance, the children got to dance along to the cool cat sounds of Huga Tuga and the Sea Animal Band. This was a fantastic kickoff to our month of reading, and encouraged participation from all students! On Tuesday, September 25th, the Myrtle H. Stevens PTO sponsored an enrichment program for all students. The program was a reading pep rally titled “Huga Tuga: Reading Rocks Live!” The presenter is author and illustrator Joe Shandrowski from Fairfield, CT. Joe and his sea monster friend, Huga Tuga, stressed the importance and power of reading. Students enjoyed participating in the program. By: Michelle Walerysiak, Teacher and Parent at Stevens.